We went on what has to be our most fun day trip this year - Newman's Castle in Belville, Texas. If you have a child who loves castles or the medieval ages, this is a must see! This is an inspiring story about a man who followed his dreams. The owner, Mike Newman, acquired his property in 1998, and spent some time trying to decide what kind of house to put on it. And we are really glad he did! He began giving tours a few years ago, and now does weddings, banquets, overnight guests and more! This is his personal home that we toured - he lives in it!! It has a moat with a real working, man-powered drawbridge! It has a dungeon. I mean seriously, if you are going to build a castle, it had better have a dungeon to throw people in, right? It has a large trebuchet, for any marauders who might feel compelled to attach his castle!. The trebuchet comes complete with ammunition that the owner merrily launches! It has a 30 person great hall, a small chapel and more! He is currently in the process of building a bell tower and six more bedrooms. We spent a good two to two and half hours exploring the place. And what makes the trip so much more enjoyable is listening to the man who built his dream. My son peppered him with questions and comments. And each one was responded to with patience. And Mike Newman built it all himself, so he can answer any questions you might have! And at the very end, he brings out lunch made from Newman's bakery. It was so good, that my son declared that the sandwich was worth the two hour drive in itself! Also on his property, he has just started keeping bees. My husband has been interested in starting a hive, so my son and I thought we'd check it out. As with everything else in the place, he let the kids come up, check it out, ask questions and more! He told us in the three months since he purchased the hives, the bees have produced 20 gallons of honey! All in all, this was a really wonderful, interesting and fun day trip!! * Everything I read said to make reservations at least a week ahead of time. Pretty good advice. But I actually called the day before, and they had room left in the tour, so it never hurts to call and ask! * This is a great tour for any age. There were toddlers to teens to adults all laughing and enjoying the experience. My eleven year old had a great time! *Tickets are $15 a piece and include a really delicious lunch. Quite a deal, in my book! * Brenham is right on the path home from Belville, so if you're looking for another fun diversion in the area, try taking a tour through the Blue Bell factory while you are there! As a parent of a teen, I find that teenhood is a precarious balance between kid and adult. Some days I am amazed by my son's responsibility and maturity. But there are times that he still just wants to play. It can be hard to find places for teens to go, where they can still play and have fun, but not tower over all the toddlers. So I culled some places from my top 50 list that are especially good for teens and pre-teens. I hope you enjoy them! We just discovered this place a few weeks ago, and it has moved to our top list. This is probably a bigger draw for teen boys then girls, but I have seen both having a great time here. They can run, jump and swing, all while using their imagination. Participants must be over 8 after 2pm. Parents of teens 12 and up can drop their kids off for a good time, parents of younger children must stay. As with most teen events, a pack is more fun than just one! So have them bring along a couple of friends. Friday and Saturday the place is open late, which is a perfect time for teens to hang out with their friends. Also voted as a top hang out for teens, this is a great place for all ages. 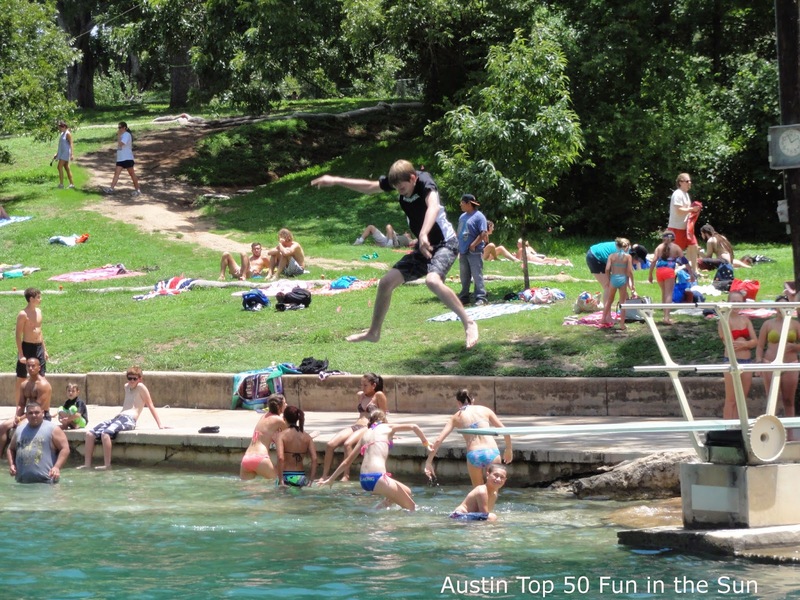 Cool off in the 64 degree water, hang out with friends, enjoy an ice cream at the snack shack. One of the most fun outdoor places for teens! This is a great place to get some exercise and have some fun. Dodgeball is a huge hit, especially when the crowd is older. Located to the west of Austin, this is a great place to spend the day. We came here when my boys were younger, but as they get older, it becomes more and more fun. The rope swing is a lot of fun for all ages. Last year they discovered the cliff jumping down a bit from the rope swing and had a blast there as well! Definitely not something for the faint of hear! There isn't much cooler than wakeboarding, and Austin has a new cable wakeboarding park in South East Austin. When we went, there were kids and adults of all ages, and lots of teens and young adults. Try out the morning summer camps, or come and spend an afternoon. Mini golf will never go out of style. And old school Peter Pan has been keeping teens entertained for decades. Go in the later hours, when the sun has set. Teens will enjoy it more, and it isn't as hot! What can be more fun that driving a go kart around the tracks at top speed? All drivers must be at least 5 feet so they can reach the pedals. K1 is located in north Austin and Central Texas Speedway is located south of Austin. Head to Big Top Candy just down the road for a rootbeer float afterwards. Austin currently has 5 disc golf courses (maybe more) sprinkled around Austin. Gather up a group of teens, a few discs, and let them go around the course. With three stories of ramps and the new elevated Austin Sky Trail (a high ropes course), your teen will be sure to have a good time here. As with most of these places, the later you go, the older the kids get. This is a great place for kids to hang out and get some exercise. Kids must be at least 14 in order to become belayed certified - otherwise they will need an adult along to access the higher rocks. Have your kids bring their bikes or skateboards, and let them try out the ramps and hills. Or, if they don't skate, they can just come and check out all the fun! Warning! Loud Noises: Rock Band Battle of the Bands! on Sunday, July 27, 3-5 PM at the Ruiz Branch. Come solo or with your own band. With over 200 pinball and other video games, there is sure to be something that interests your teen here. We have gone as a family for the last couple of years, but last year I noticed that, in addition to blankets of families, there were a number of teen groups hanging out here. We haven't been here yet, but it seems like a bunch of fun. Gather up a bunch of your kids' friends, pile them into the car, and introduce them to an old school movie in an old school way! Located downtown. Austin now has its first ever cable wakeboarding park! If you haven't been, you really need to try it out! It is a great experience for every skill level, from beginner to expert. Quest ATX opened its doors in September of last year and has been fully up and running this summer, including morning day camps every week from 9am - 1pm. Located in Southeast Austin, sort of near Circuit of the Americas, this 130 acre park is a great place to spend the day! Quest ATX invited us out to try their facility and we finally got out there this week. So this was a totally new experience for us! My youngest son tried wakeboarding a couple of times. And then later in the day he also tried kneeboarding. After awhile, he decided he preferred just hanging out in the water and watching the other skiers go by. My older son, however, was a lot more determined. He tried non-stop for a good two hours. Finally on his second to last run, he was able to get up for a short run! Now that he's got the knack of it, he is dying to go back and try it again! * They have a beginner hour everyday from 12pm - 1pm (M-F) or Saturday 10-11am . During beginner hour they slow the cable down which makes it easier to get up. If you have not been cable wakeboarding before, I would highly suggest trying to arrive at the earlier hour. * There are still some spots available for the week long youth (6 - 16) camps that look like a lot of fun. They run from 9am - 1pm Monday thru Friday and will teach your child to wakerboard, water ski, stand up paddleboarding and kayaking! * There are some snacks and cold drinks on site, but if you plan to spend the day, pack a picnic lunch to bring with you! * Their rates are very reasonable. $30 for two hours or $35 for four hours, plus a $5 helmet rental fee. Children under 17 are half off. There is also currently a groupon available for $45 for four hours for two people. We added Hot Lava to our Top 50 list this spring and finally made it out to the place this week. I have to say, this may just be our new favorite indoor place!! "more than 1500 square feet of obstacle course and parkour gymnasium." I have to admit, I wasn't sure exactly what that meant, but it sounded perfect for my teen and pre-teen boys. A great way to get them some exercise in the 100 degree heat. When we showed up and glanced through the windows, we were somewhat surprised by the small size of the place. It is located in essentially two store fronts. Two and a half hours later of non-stop movement, they were fully climbed, jumped, swung and crawled out! We might have stayed even longer had I remembered to bring snacks. The really awesome thing about this place is how free-form it is. It really allows the kids to be creative. At one point, our smallest friend pulled one of the half balance balls into the lava pit, which then gave him the additional height he needed to climb into the overhead cargo net. Ingenuity at its best! There are pads on the floor and obstacles and ramps that can be moved around to meet anyone's needs - whatever they dream up. In the two hours, I saw them jump through hoops doing a double roll, climb the walls, swing from ropes to rings to the lava pit and so much more. The lava pit is great for jumping into. But the lava blocks are also great ammunition in tribal wars, or they can be stacked and covered with a mat to make a fort, or they can make a wall to slam into. It was really fun to see all the different uses the kids found for these blocks! This is a great place to get the wigglies out, while allowing kids to be creative! It is also a great place for adults to get some exercise while having a great time. * Children under 8 can only be in the building until 2pm. Parents of young children are required to be on the floor with their kids (which makes perfect sense - as they really will need an adult's support). Parents of children 8 - 12 just need to be present in the building. * Teens and pre-teens will probably be happiest coming after 2pm, as they won't have to navigate around wee ones... but mine seemed to have a good time both before and after 2pm. * We did see some adults in there as well - and this would be great exercise. I'm kind of bummed I didn't play along with them! I'm guessing that the after 5pm crowd is mostly adults. I've been wanting to visit this new pool since it opened last month. We finally had a chance today to check it out! I have to say, this may be my new favorite public pool. There is something for everyone. My oldest son loves the diving board, and can jump off of one for hours... and there are not that many pools with diving boards these days. There are also two large slides. And a lily pond for the kids to cross. There is also a zero entry section with a small slide for the smallest of visitors. There was only one lap lane for those who actually want to swim. But fortunately, that doesn't seem to be the goal of most visitors, as the lane was empty much of the time. At one point, there were three of us doing laps, but for the most point, there was only two of us, and the lane was plenty large enough! And all of this - and for me and four kids it only cost us $8! The only downside of this pool is that it was **packed**. So packed that my youngest son felt somewhat uncomfortable. Fortunately my boys are old enough that I don't have to keep a constant eye on them. But for slightly younger children, they might get lost in the crowd! I'm tempted to try this pool later in the evening, to see if it is still so crowded. But in all, we'd definitely check this place out again!